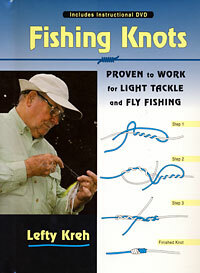 LEFTY KREH has been teaching knot tying alongside casting and fly fishing techniques for longer than most of us have been fly fishing. He’s also written at least three important books on knot tying. He started with Practical Fishing and Boating Knots in 1975, then followed up with Practical Fishing Knotsin 1984, and then in 2004 published Fly Fishing Knots and Connections. It’s satisfying to see him continue to improve on a good thing with Fishing Knots. The new book is hard/spiral bound, which means you can open and lay it flat on a table while experimenting with knots. More importantly, it includes a high-quality DVD of Lefty explaining and tying several important knots and connections, including the Blood Knot, the Albright, the Clinch and the Kreh Loop (considered by most to be the best loop knot for smaller diameter leader material). We’ve long believed that illustrations alone don’t cut it when it comes to clearly demonstrating how to tie knots, so it’s nice to see Stackpole go to the expense of producing the companion video. The video segments themselves were obviously not closely edited, but this actually helps communicate Lefty’s unique teaching style. Lefty’s been using this type of illustration in his knot books for a long time. In Fishing Knots, the illustrations are larger and clearer. This example shows how he illustrates one step in the tying of a Blood Knot. Illustration by Dave Hall. That example also harkens back to Lefty’s knot mantra, which is that “every knot slips before it breaks.” I’ve never been entirely sure of Lefty’s logic here, probably because I’ve seen many thoroughly tightened knots break because improper tightening itself seemed to create a weak spot, but my second-guessing is purely that. The point is still well made: be sure you lubricate and tighten your knots thoroughly and carefully. Some readers would no doubt have found knot strength percentages helpful, if only to give confidence in the examples, but Lefty mentions few knots that don’t have a potential strength above 90 per cent. It’s a departure from what we may be accustomed to, but the choice itself proves the point that every knot has specific advantages and occasional uses for which it is inappropriate, and knowing what those are becomes more important once you start with a collection of high-percentage knots. Kreh includes a 63-minute DVD that reviews line materials and demonstrates several key knots — a great bonus for those who want to see the exact hand motions required. There are a few kinks in both the book and the video — some of the illustrations don’t perfectly show line directions and sequences, and there is a demonstration of using forceps to tie a Blood Knot that seems to us to clearly invite weakening of the leader (as does the use of a razor blade in the DVD to trim tag ends) — but the wealth of information here is really impressive. 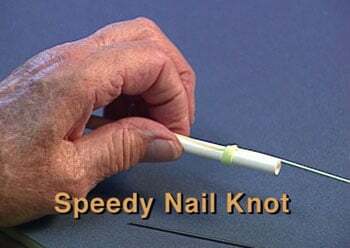 You’ll find instructions on most of the classic and a few new, but important knots and connections here: the Slim Beauty, the Fisherman’s/Pitzen/16-20, the Kreh Loop, the Whip Finish, the Speedy Nail Knot, the Surgeon’s and the Bimini Twist are just a few of the more than three dozen described. If you have yet to buy a book about knots and knot tying, or if you’d just like to stay current with the best book of simple and useful knots out there, this is the book to own. Buy Fishing Knots on Amazon.